In this installment of our ongoing series, we visit some of the great Southern cities to understand the role of the Southern live oak in urban design and Southern culture. The Southern live oak provides cover and shade not only for jays and squirrels, but for humans as well. Although prevalent across a wide area, its most iconic presence is in the great cities of the South. 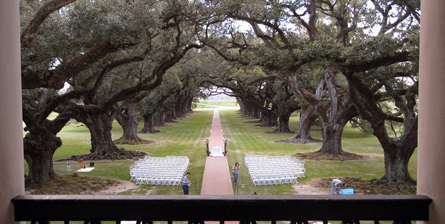 Live oaks shade the squares of Savannah, the streets of Charleston, and the magnificent avenues of New Orleans. For example, St. Charles Avenue in New Orleans, called “The Jewel of America’s Grand Avenues,” is known as much for its oak-shaded streetcar lines as for its grand antebellum mansions (1). The Southern live oak’s distinctive shape makes it a valuable urban architectural element. It has a “broad crown, with long arching limbs that spread horizontally rather than vertically,” creating large areas of inviting shade (2, 3). Its hard, strong wood, once highly prized for shipbuilding, makes it highly durable. Due to its appeal, it is estimated that “a single live oak can add as much as $30,000 to the value of a house” (4). 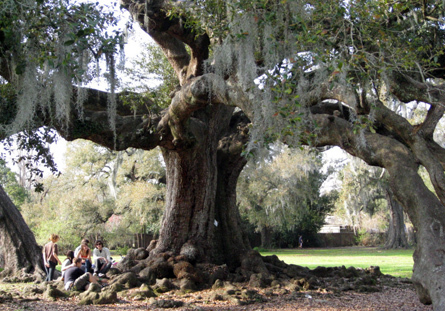 “In Southern history, live oaks were landmarks where people met to socialize and conduct business,” says Tova Spector of the University of Florida (5). “In the opening scene of “Gone with the Wind,” Scarlett O’Hara flirts with bachelors under live oaks at a barbecue. Similarly, Marjorie Kinnan Rawlings ends her book “The Yearling” with the hero saying goodbye to his childhood under the live oak trees” (6). For many people, the live oak – with the mistletoe and Spanish moss that often grow on its limbs – is deeply associated with the image of the South. Previous: A description of the Southern live oak. Next: Hurricane Katrina and the Southern live oak.